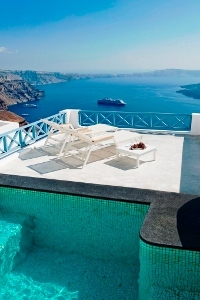 Gorgona Villas, a traditionally built hotel complex perched on the Caldera Cliffside with its privileged location allows spectacular views to the volcano and the Aegean Sea. The hotel is only few minutes walking distance to shopping area, super markets, taverns and restaurants as well as the central bus stop in Imerovigli. Hotel facilities include reception, a mini pool/outdoor Jacuzzi where guests can relax and admire the views, Gorgona Café where homemade breakfast is served on the shaded terrace of inside its cozy interior area, daily maid service, free Wireless Internet, valley service, parking space (available near the hotel). All units are fully air-conditioned and have direct dial phone, safe box, hairdryer and satellite tv, while suites additionally have LCD TV and CD/DVD Player. Some rooms and suites have a fully equipped kitchenette; others offer a kitchen corner with coffee/tea making facilities. Gorgona Superior studios: modernly furnished, spacious, with one double bed, sitting area and bathroom. Some with kitchenette or coffee/tea-making facilities and mini-bar. Gorgona studios: decorated in traditional Santorinian style, with one double bed, some with kitchenette or coffee/tea making facilities and mini bar. Gorgona suites: consist of one bedroom (double bed) and separated living room with extra sofa beds (or in open plan), fully equipped kitchenette, refrigerator and veranda or balcony facing the Caldera.